Hostel Hunting helps students search for rental properties close to their university campus. Its website allows students to filter through verified property listings by area or institution, and communicate directly with potential landlords through its messaging feature. It takes a service fee for every successful booking. The startup operates in Malaysia, Thailand and Singapore. Kuala Lumpur-based student accommodation platform HostelHunting announced today that it has raised an undisclosed Series A funding round. Student accommodation platform HostelHunting has just closed its Series A round and will use the funding to further its product development and hiring plans. HOSTEL Hunting, a room rental platform focused on student accommodation, has been steadily expanding since it was established in January last year. The homegrown startup began with 300 rooms and increased its offering to 71,000 sourced from 5,000 owners as of November. Wanting to solve a problem faced by students from local colleges and universities, 4 founders came together back in January 2015 to create a room rental platform that focuses on student accommodation. HOSTELHUNTING.com, a student accommodation marketplace, has successfully raised US$500,000 (RM2,149,7000) in a seed round led by KK Fund, followed by Incubate Fund and Cradle Fund (CIP 500). Malaysia-based student accommodation marketplace HostelHunting.com has raised $500,000 in a seed round led by KK Fund, with funding participation from Incubate Fund and Cradle Fund under the CIP 500 grant programme. The Malaysian online student accommodation marketplace will use the funds to build a team, develop new features and expand regionally. Over the past year, the Bangsar-headquartered student-accommodation platform has gone from listing 600 Subang units to offering over 21,000 accommodations spanning 75% of Malaysia, from Penang to Johor. That's more than 30 times growth. Looking for a place to stay is by no means an easy feat especially for college-goers, but a local website is offering a convenient platform for them to find suitable accommodation. Hostel Hunting understands exactly the obstacles and challenges that students faces when looking for a space and aims to provide the right tools to ensure a safe and hassle-free procedure. Amazing Malaysian Startups Set To Influence Your Lives In 2015. The main feature of Hostel Hunting is to help students find the right place for themselves. 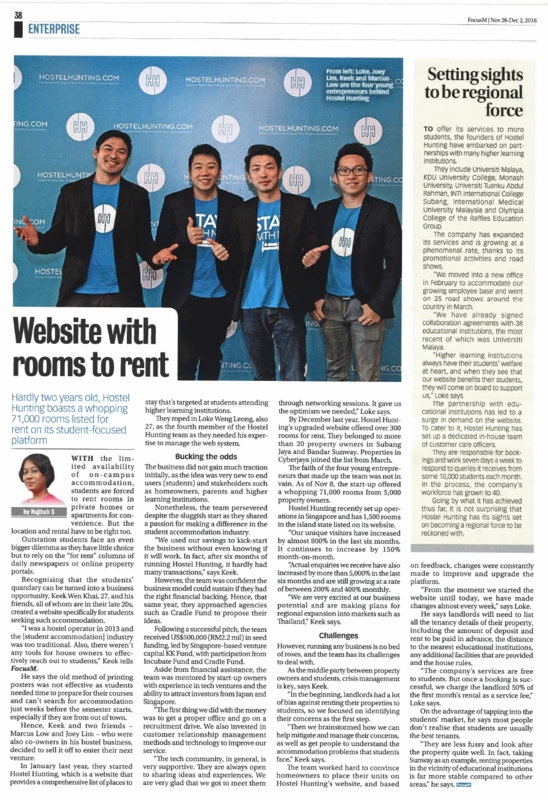 Local startup HostelHunting.com is looking to shake up the student housing scene with its online booking marketplace.